Threads is a follow-up to my earlier piece Made in Motherland, which was a response to the skepticism over food safety and quality control of the products imported from Mainland China to Hong Kong. Threads is likewise a critique of the processes of artificial modification and transformation of an animal. I wanted to use my previous piece as a departure, to then offer the animal my personal, spiritual outlook to its transformation. I was inspired by wet market scenes where I find to be both a fascinating and a questionable place. Poultry skins were shamelessly hung facing the public, making a beautiful and ghostly sprawl across the chopping board while still holding the shape of the animal that was just slaughtered. The imagery urged me to trace the history of these poultries: where they came from, how they got here, and the treatment within the process that might have modified them. Sometimes one could read into the smeary labels that were stamped on the animal’s skins to find clues of information, only then to question its trustworthiness. 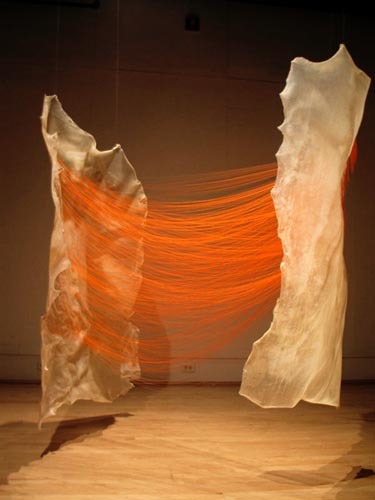 Threads is the ethereal process of flowing and shifting, mutating and reincarnating. It is a question of our fate, and our connection to everything around us.